As I mentioned in my last post about Elena of Avalor, today was the premiere of Realm of the Jaquins. In this hour long TV special, Elena travels to Vallestrella, home of the legendary jaquins, the mythical winged jaguars that are the national animals of Avalor. Anyone who has seen Elena of Avalor is already familiar with the jaquins. Elena was always good friends with Skylar, who often let her ride him just like Sofia the First flies round on Minimus. This special revolved around the training of the three youngest jaquins--Nico, Ciela, and Avion--to be guardians. When Nico was unfairly stripped of the chance to pass his test due to the meddling of the villainous Victor Delgado, Elena sought out the jaquin king, Verago, in Vallestrella to convince him to give Nico a second chance. In some ways, this episode is more of the same, as Elena once again represented Avalor as an ambassador to an royal ally and practiced her lackluster diplomacy skills. However, there were also things that stood out from previous episodes. For instance, the kingdom of Vallestrella was visually stunning. It was very different from Avalor because it was inhabited only by animals, which negated the need for palaces and fancy architecture. It looked more like a majestic jungle instead of the medieval version of an industrial Spanish village. I also loved the designs for the new characters. Quita Moz, the colorful dragon who aided Elean on her quest, reminded me of a nicer version of Aku from Samurai Jack. He had an original design and a unique personality. His ability to read the future in his magical blue flames was quite neat. I'm not entirely convinced that he was actually trying to help Elena by asking her to bring him the wicked forest sprite, Marimonda, though. I wouldn't be surprised if he turns out to be secretly evil in a later episode. He did come in handy by teaching Elena another trick she could do with her staff, a lesson that she desperately needed, considering how little she knew about it. My favorite thing about this special was the villain, Marimonda, the forest sprite. She had a fun design that was reminiscent of the Spring Sprite from Disney's Fantasia 2000. Just as you would expect of a sprite or pixie, Marimonda was feisty, self-absorbed, and mischievous. She also sang one of the three songs in the episode. If anyone deserved a song, it was her. Like all great villains, her motivation made sense. She was born from nature and wanted to destroy anything man-made and restore the land to its original natural beauty, which was a problem for the Kingdom of Avalor. 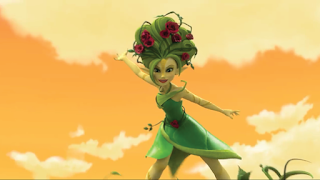 Her powers allowed her to grow beautiful vines and flowers on anything she touched. The "surprise" ending was long overdue and had already been heavily foreshadowed in Elena and the Secret of Avalor. If you haven't figured it out yet, one of Elena's old foes is about to return. Though this scene was very predictable, I did like that they brought back Estaban's old foe, Victor Delgado and his daughter, Carla, from King of the Carnival because they were pretty interesting characters. If they stick around, we may finally learn more about Esteban's mysterious past, though he was mostly absent from this special. Overall, Realm of the Jaquins was a mediocre TV special of a pretty mediocre princess show. It taught us more about the jaquins' culture and set up some stories for future episodes. Elena learned a cool new trick for her scepter that we're sure to see again soon. In my opinion, the only thing made it worth watching, though, was the feisty forest sprite, Marimonda. Review: Mysticons - "Sisters in Arms"
The Burning Question: Is Mulan a Princess?